A modern collection of classic, circuit bent and resampled electronic drum sounds suitable for a wide variety of genres and production styles. Pristine classics, otherworldly one of a kind bends, and gritty must haves make this the hottest collection of electronic drums imaginable. This EZX® includes 33 meticulously crafted kits with additional menus of the most requested electronic kick and snare drums. It also features our ever-popular use of parallel FX processing for unlimited variation and new sonic depths. With this EZX®, you will be able to cover a broad range of popular and emerging electronic genres. You name it.... House, Dub, Techno, Progressive, Pop, Hip-Hop, Rap, Electro, Grime, Jungle, DnB, RnB, Dub-Step, Trip-Hop, Acid, Disco, Electro-Crunk, Ghetto-Tech, Baile Funk, Industrial, Garage, Experimental, Noise-core, Hard-core, Minimal, Glitch, Gabba, Ambient, Trance, Miami Bass, 2 Step, B-more and many more... its in here!! Lead designer Richard Devine is an award winning electronic artist who stands amongst an elite few as a pioneer in modern music. He is a master of synthesis, sequencing virtuoso, and legendary amongst the electronic underground for his seamless integration of hardware and software based technologies resulting in a relentless and improvised live set. He is also revered for his countless sound design contributions found in many of the most popular hardware and soft synths, video games and commercials over the past decade. He has been tapped by numerous multi-platinum and underground legends for remixes and sound design work. It is key to note that for some of the recordings, Richard was assisted by the masterful Josh Kay of Phonecia/Schematic Records. Their talents were met by our Ace team of producer/designers - Brad Bowden and Mattias Eklund - the dynamic force who has overseen all of Toontracks beloved EZX® and SDX™ libraries. The result of this dream collaboration is a powerful, expressive and inspiring set of electronic drum kits. The Electronic EZX®, like all Toontrack libraries, is optimized for impact, sonic integrity, and immediate usability. 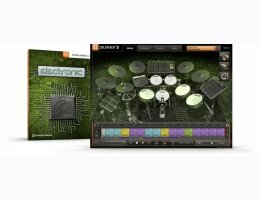 This EZX® will also excel in Superior Drummer® 2.0 via the new X-Pad functionality for creating new Hybrid acoustic/electronic kits.